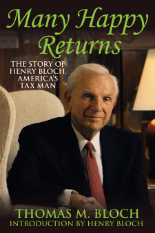 Henry Bloch is America's tax man. He and his brother Richard pioneered the commercial tax preparation industry, and the two tycoons built the world-leading firm that has prepared over 500 million returns, H&R Block. But Henry's life deserves to be studied for another reason: His remarkable entrepreneurial philosophy and extraordinary humanitarianism will have a lasting impact on generations. Many Happy Returns tells the compelling story of this unlikely American hero through Henry's son Tom, who worked alongside his father for nearly twenty years and interviewed him extensively for this book. As a budding entrepreneur, Bloch could barely eke out a living. Discover how he started his company from the bottom up, and get a rare look at the inner dynamics of one of the most well-known brands in America. Along the way, you'll also meet some of the people who shaped his philosophy on business and life, and receive invaluable tips on entrepreneurship from the man whose hard work, vision, and pioneering spirit set the standard for those seeking true success. As much a personal story as a business story, Many Happy Returns offers intimate details about Henry Bloch's belief in the importance of mentoring and giving back. Woven within this rich history of H&R Block are examples of philanthropy and social entrepreneurship. In a time filled with greed and corruption, Henry Bloch inspires us to work hard, be honest, and follow our dreams. His ingenuity, determination and core values propelled him to the pinnacle of business success and have allowed him to help others through countless charitable efforts. This book is a fascinating portrait of one of America's greatest entrepreneurs, and it shows you what it takes to succeed — in both your professional and personal life. Once you’ve read this story of struggle and success, you’ll never feel the same about April 15th! Thomas M. Bloch is an author, speaker, educator, entrepreneur, former CEO of H&R Block, and the son of its co-founder, Henry Bloch. Tom worked closely with his father at H&R Block for nearly two decades, serving as President and CEO while Henry was Chairman of the Board. In 1995, Tom Bloch resigned as CEO to become a teacher in an impoverished inner-city section of Kansas City. He co-founded University Academy, an eminently successful urban college preparatory charter school. Tom's highly acclaimed book, “Stand for the Best”, chronicles his journey from the corporate boardroom to an inner-city classroom.